“Pet Away Worry and Stress” — what could be better? This is the goal of Macalester’s therapy dog program, [email protected] (PAWS). PAWS aims to reduce the stress of Macalester students and brighten their days by bringing trained therapy dogs to campus. “[PAWS] aims to bring therapy dogs and stress relief to campus,” Brooke Offenhauser ’21, the student coordinator for PAWS, said. PAWS was founded in 2015 by Dr. Steph Walters, director of medical at the Laurie Hamre Center for Health and Wellness. Walters proposed a pilot program in the 2015-2016 school year to bring her golden retriever, Kevin, to campus twice a week. Now, PAWS has expanded the program to five dogs that are on campus at least three days a week. The dogs are Kevin, Will, Bubba, Koski and Leo. They all love coming to campus and are ready to receive pets and hang out with students when they are around. Kevin is Walters’ seven years old golden retriever who is the original PAWS dog. Kevin was named by Walters’ kids after the rainbow bird in the movie, “Up.” Kevin’s favorite treats are jelly toast and empty yogurt containers. Koski, Leo, Will and Bubba are the other four dogs. Leo loves herding sheep and ducks in his free time, and Koski loves peanut butter and sniffing around the Leonard Center. Will’s favorite food is the bananas he gets in his breakfast sometimes — which he likes better than the blueberries he’ll get other times. Bubba loves to eat just about everything but is picky about fruits and vegetables, and he knows how to work a crowd. There is evidence that therapy dogs on college campuses reduce student stress. Therapy dogs have been on the rise on college campuses since the mid 2000s, and they have been making a positive impact ever since. Offenhauser recognizes the benefits that dogs bring to Macalester students. “I think it is really important in regard to stress relief because there are so many people who are stressed on campus and every time you see a dog you get excited. It’s also a really good opportunity for people who have dogs at home and aren’t able to go home and see them — they can get their dog happiness that way,” Offenhauser said. Dogs, and in particular, therapy dogs, can increase the level of the hormone oxytocin in humans which helps reduce anxiety and blood pressure. Therapy dogs can create a sense of well-being and calm in people and simply interacting with dogs can help increase general well-being. “I love trying to think of reducing stress, promoting wellbeing in a number of different ways. 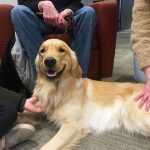 Therapy dogs typically bring a lot of joy at almost zero cost/budget and are accessible to more than one person at a time,” Walters said in an email to The Mac Weekly. One of the reasons that therapy dog programs have shot up on college campuses around the country is that they are low cost to the institution. As more and more students seek mental health services on their college campuses, it becomes imperative that colleges find ways to reach many students at low costs. Offenhauser is excited by the enthusiasm that PAWS brings to a lot of students and not just when they are physically with the dogs. PAWS uses social media to promote the program and to show what Kevin is up to when he’s not working at Macalester. “Students that I’ve talked to almost always respond positively and are very excited to see the dogs and are always really excited to see Kevin on campus and see his Instagram and all of those things,” Offenhauser said. Denise Ward, associate dean for student services, is a PAWS handler and sees the effect the dogs have on many students firsthand when she brings in her dog, Koski. “One can see the calm come across the student as they stop to pet the dog. It provides a time to take a break and not think about class or things you have to do for that moment; engage with a being who will love you just because you are there and you are perfect to them… [email protected] provides this. 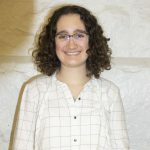 I see it as a small, but effective tool in the college’s efforts to contribute to the wellbeing of our students,” Ward said in an email to The Mac Weekly. Another PAWS handler, annual fund office coordinator, Ann Warren witnesses the influence her dog, Bubba, can have on students and how just a few minutes with her dog can completely turn around a student’s emotions and day. Will, a [email protected] dog, with his human, Cheryl Doucette, at the library during his office hours enjoys love and attention from students. Photo by Barbara Kuzma ’21. “I’ve witnessed a real impact on the people who visit with him. I’ve seen people go from crying or near tears to smiling and going about their day with renewed resolve after a few minutes of petting Bubba… It’s remarkable what a difference a few minutes with him can make in the emotional well being of a person who needs it,” Warren said in an email to The Mac Weekly. Overall student response to the program has been positive, but PAWS staff recognizes that not all students are comfortable with dogs. “One challenge is knowing that while dogs bring joy to some, for others they trigger allergies, unpleasant memories, fear or they have a cultural view that does not see dogs as animals of comfort. There is no need for everybody to get to like dogs or seek them out as comfort, I believe it’s our job to make everybody on campus feel as safe and comfortable as possible,” Walters said in an email to The Mac Weekly. All of the PAWS dogs are trained therapy dogs and the PAWS team has created a number of guidelines and rules to make sure that the dogs are a safe space. Their dogs are always on leashes, and all dogs have taken obedience and training classes to certify them as actual therapy dogs. The staff tries their hardest to make the dogs’ whereabouts known when they are working so that students who are not comfortable around dogs are aware where the dogs are and so that students who want to see the dogs know where to find them. “We try really hard to publicize where the dogs will be so they aren’t a surprise and to work really hard to never assume that our dog will bring somebody comfort — let people approach us, never the other way around,” Walters said. One of the bigger challenges PAWS runs into is that there are a lot of enthusiastic dog owners (and dogs) who want to be a part of PAWS, but the dogs are not trained therapy dogs. While a lot of dogs are cuddly, friendly and cute, in order to be apart of PAWS, a dog must be a trained therapy dog. “People don’t realize the specialized training that goes into becoming a therapy dog — many [people] contact us with ‘how can I be a part of PAWS, I have a great dog,’ but Brooke [Offenhauser] helps them realize what next steps are when they e-mail us,” Walters wrote. PAWS is an important program on Macalester’s campus that allows students a chance to reduce their stress throughout the day without needing to seek counseling or medical services. PAWS has a widespread impact on the Macalester community and most recognize how the dogs brighten days and help students make it through the ups and downs that the schools year inevitably brings. Bergen (she/her/hers) '22 is an associate features editor from Revelstoke, British Columbia. She enjoys dairy-free, gluten-free snacks and says sorry a lot.